“You asked, and we listened! We wrote this guide in response to requests from EHS professionals just like you. 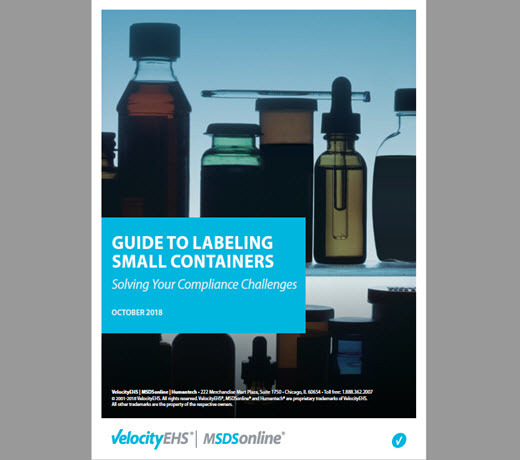 Finally, get the guidance you need to solve the compliance challenges of small container labeling! HazCom continues to rank as OSHA’s 2nd most frequently cited standard, and labeling is a particularly vexing issue, especially when it comes to knowing what OSHA does or doesn’t allow when it comes to labeling small containers. Even worse, it can be difficult to find OSHA’s available guidance on this issue. Our new guide helps you manage your small container labeling obligations by compiling OSHA’s most important and relevant guidance in one place. By using this guide, you’ll be able to reduce anxiety around small container labeling and improve your overall HazCom management. Copyright © 2001-2019, VelocityEHS. All rights reserved. VelocityEHS® and MSDSonline® are proprietary trademarks of VelocityEHS. All other trademarks are the property of the respective owners.